I have been meaning to try this series for ages--thanks for the push to actually do so! 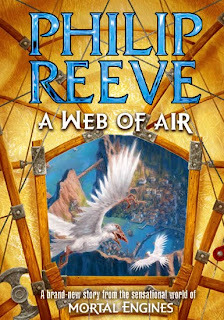 I love Philip Reeve's books, I've read all the Mortal Engines series so far so I'm really looking for this to be released. Im currently reading the final book of the Art and Myrtle series Mothstorm at the moment, its light easy reading and very enjoyable. Kids will love these books like myself; I'm a big kid at heart I turn 29 this year and I don't care. Keep the books coming Philip. Thanks Paul for the comment. I also loved the Larklight series of books by Philip. What do you think of the illustrations by David Wyatt? You are never too old to read great books. I'm also a big kid!